Avery half page sheet protectors made of clear poly for no ink lifting off prints or ink jet prints. Open on the top side with 7 holes on the 8.5 inch side for fitment of a number of configurations of ring metal types. 50 per pkg. The solution to keeping your important papers protected is clear?diamond clear, in fact. These Diamond Clear Heavyweight Sheet Protectors are designed both to protect your papers and show them off impressively. Diamond-clear material delivers a crisp view of your pages as well as durable protection. The acid-free and archival-safe material ensures your pages stay in top condition and that print remains on your papers, rather than transferring to the sheet protector. 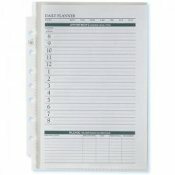 The protectors' clear binding edge rounds out the professional look of your presentations and other documents.